Loved Hearthstone? Try these alternative PvP collectible card games that are easy to pick up but just as hard to master! Amidst a wealth of new video gaming mechanics, it’s heartening to see many modern gamers still enjoy playing good ‘ol fashioned collectible card games. One of the most popular online collectible card games at the moment is Blizzard’s runaway hit, Hearthstone: Heroes of Warcraft. Available on multiple devices, this massively successful release belongs to a sub-genre filled with lots of high-quality and insanely addictive games like Hearthstone – some imitators, others innovative. As always, we at Games Like Zone have put together for you an original list of 10 Online Collectible Card Games Like Hearthstone based on specific criteria. Of course, none of these games are 100% analogues to Hearthstone – but they do share many common traits that Hearthstone fans will likely enjoy! Hearthstone’s beauty lies in its basic card game rules (i.e. attack / defense / special stats) with surprising strategic depth. Thus, like Hearthstone, the online collectible card games listed here must be simple to play but hard to master. They should also be turn-based. An online PvP option is a must. You need to be able to win rounds, battles, matches, etc. with real players via a network. Seems obvious enough… but you’ll be surprised how many other collectible card games don’t actually offer online modes. What’s the point of letting you collect cards if you can’t decide how and when to use them? Thus, all of these collectible card games like Hearthstone allow you to build your own deck and play in your own style. There’ll be plenty of chances for you to stun opponents with your rare cards! Games like Hearthstone tend to use a LOT of different sub-genre names (e.g. BCG, TCG, OCG, etc.) that almost mean the same thing (not always, though – but most times). For your convenience, we’re grouping all of these games under a general CCG heading. Selections are in no particular order. Be sure to also check out our Honorable Mentions section for more suggestions. An additional word: Obviously, each of these games like Hearthstone has their own unique lore, strategic nuances, and so on. To keep things short and sweet, we’ll stick to highlighting some (not all) of the main similarities / differences they have to Hearthstone. Also, we recognise Hearthstone is not the originator of many of its rules and mechanic styles, having lifted ideas off older collectible card games – some even included in this list! Why it’s Similar: Shadowverse is one of the most popular games like Hearthstone around. Similar to Blizzard’s CCG, you’ll be spending points to use cards with unique attack and defense values, with the number of points increasing with every turn you take. This will be very familiar territory for you as a Hearthstone fan. 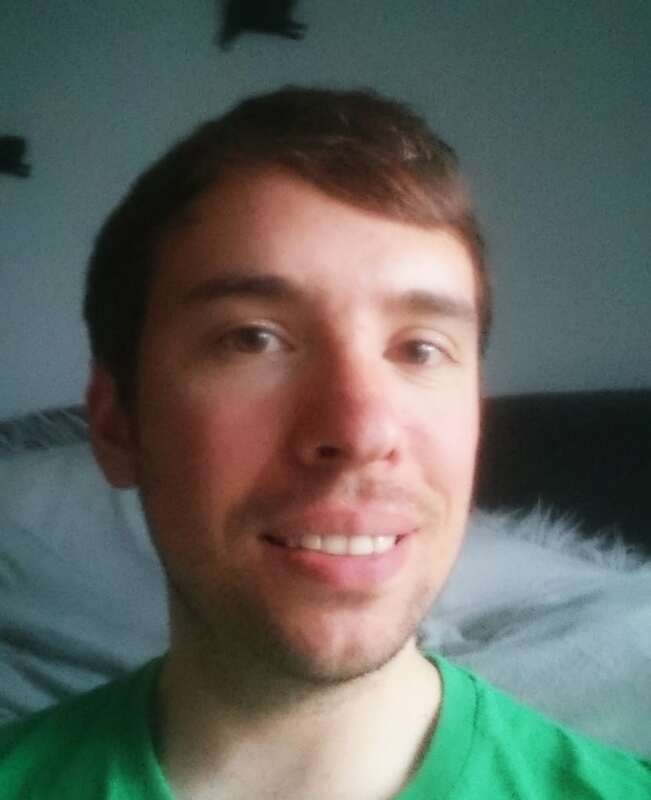 Why it’s Different: So, maybe to avoid an outright lawsuit, the developers of Shadowverse did put a bit of effort into shaking things up, just a little. First, the game has a unique Evolution mechanic, letting you power-up cards up to 3 times in a battle. Of course, you’ll need to use this in strategic ways, since there’s no point in holding onto Evolution points if you’re already getting clobbered. The cards you choose to Evolve also matter (e.g. why upgrade a fairy into a slightly better fairy when there’s a cool dragon you can power-up instead?). Also, Shadowverse has got a pretty decent single-player story mode that’s surprisingly more fleshed out than Hearthstone’s Adventures. The game also takes its visual cues from anime art, rather than Hearthstone’s more traditional fantasy theme. Overall: As a Hearthstone fan, you’ll feel right at home with Shadowverse. Differences are minor, but meaningful enough to matter from a tactical standpoint. Sadly, Shadowverse is only available for Android and iOS at the point of this writing. PC and Mac users – sorry! Read more honest player reviews of Shadowverse. Why it’s Similar: Like Hearthstone, Spellweaver is a CCG with tons of cards to collect and has a similar fantasy setting too. On top of this, many of the main mechanics you’ll use will be very familiar, with each card having easily discernable attack and defense attributes. ‘Hero’ characters also have skills that can affect the outcome of your battles. Why it’s Different: Though familiar, the core mechanics in Spellweaver are a bit more intricate than Hearthstone’s. For example, there’s a level and color-based system (yellow-gold, blue, green, red, purple, and black) that’ll determine which cards you can play at any given time. Cards also have a ‘speed’ attribute not found in most other online collectible card games like Hearthstone. 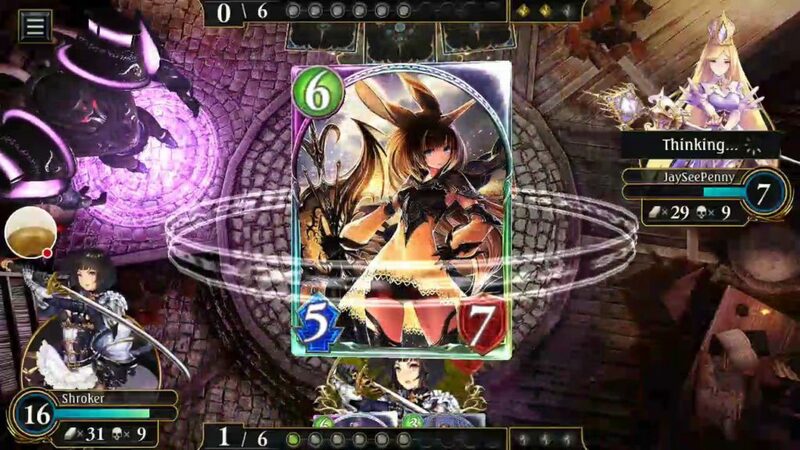 Overall, this CCG is more akin to Magic: The Gathering than Hearthstone. No surprise really, given that it was designed by Ivko Stanilov, a former Magic champ! Overall: A definite recommendation if you’re searching for more online collectible card games like Hearthstone. Spellweaver’s slightly more challenging to pick up than Hearthstone but will ultimately be worth every minute of your time. Read more honest player reviews of Spellweaver. 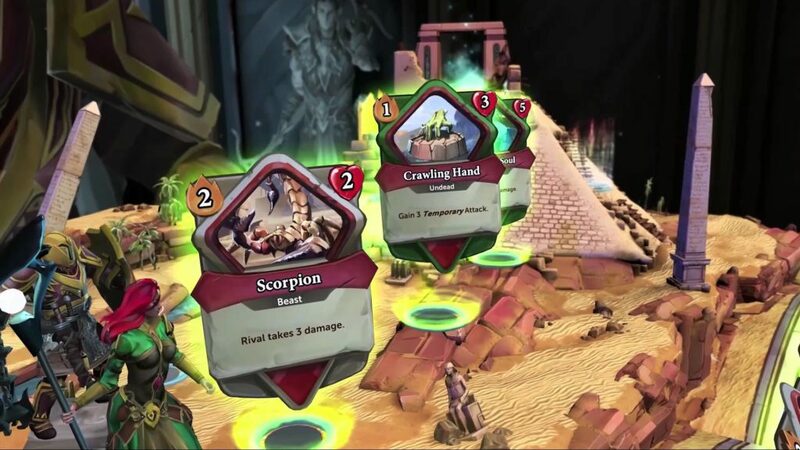 Why it’s Similar: On the surface, Chronicle: RuneScape Legends appears to be like most other online collectible card games like Hearthstone. For starters, it’s a card game based off a popular MMO – just like Hearthstone! Also, all of the usual CCG elements are here (stats, buffs, etc.). Aesthetically, both games rely on bright colors and evoke (kinda) similar fantasy themes. Why it’s Different: There are many key differences between Hearthstone and Chronicle (so, fanboys, hold your horses!). For starters, Chronicle: RuneScape Legends has more of strategic ‘board game’ vibe to it rather than being a flatout card game. There are also far stronger elements of RPG levelling and character upgrades compared to Hearthstone. Most importantly, in Hearthstone, you use the cards you draw to attack your opponent – in Chronicle, the cards you pick actually attack you! Check out this link and this one for a full list of notable differences. 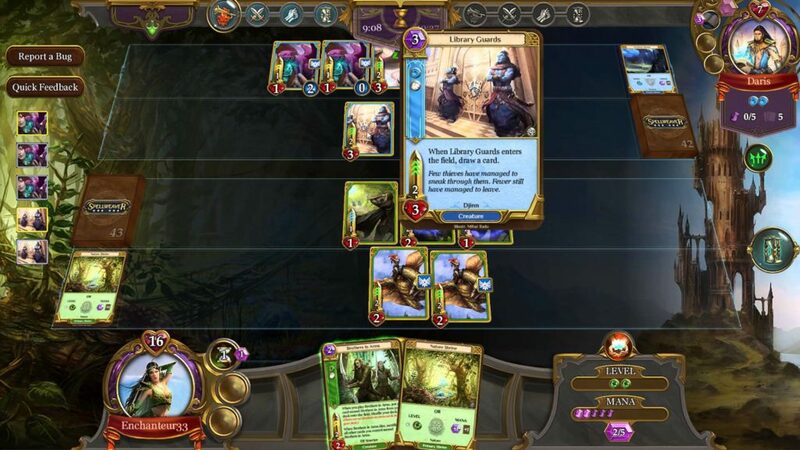 Overall: Although outwardly similar, Chronicle: RuneScape Legends actually plays very differently to most other online collectible card games like Hearthstone. Still, we decided to include it on this list for the addictive CCG fun it provides which Hearthstone fans will almost surely enjoy! Read more honest player reviews of Chronicle: RuneScape Legends. Why it’s Similar: Magic Duels is, like Hearthstone, set is a fantasy universe with tons of cards to collect, all with different stats. You’ll also be able to custom build your deck to suit your strategic style. Note: It’s actually fairer to say that Hearthstone borrows a bit from Magic Duels, rather than the other way around. After all, this is a game based on Magic: The Gathering – the Grandaddy of all CCGs! 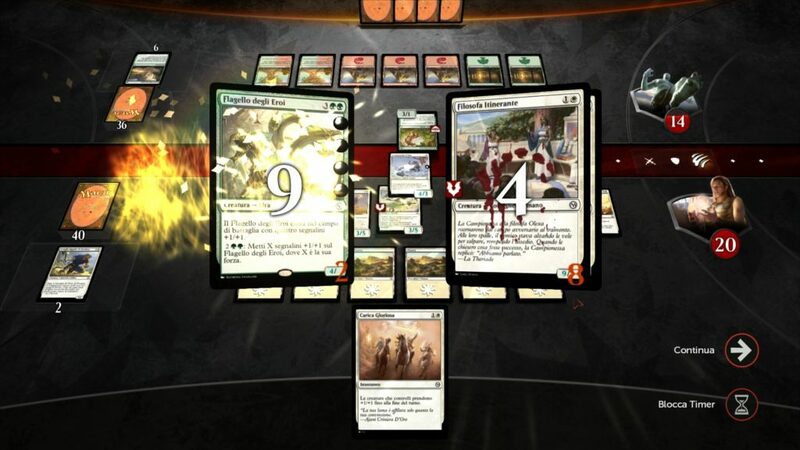 Why it’s Different: Magic Duels is a fast-paced version of Magic: The Gathering. In Hearthstone, your resources naturally increase with each turn. With Magic Duels, you need to manually plan out which cards to play to build up your mana. On top of this, different spells require different kinds of mana, thus adding a degree of complexity not found in Hearthstone. You can check out this fuller list of differences between the two games. Overall: Like other games like Hearthstone, Magic Duels is a definite must-play for any player who loves collectible card games. The strategic depth here is admittedly more challenging – though no less addictive. Read more honest player reviews of Magic Duels. Why it’s Similar: A CCG based off an existing videogame series? Sounds familiar. Gwent was actually a mini-game found inside Witcher 3. However, it turned out to be so popular that there’s now a full spin-off release in the works (set to be released soon). Akin to other games like Hearthstone, you’ll want to avoid playing your strongest cards too early in the game. Much of Gwent also boils down to having cards with the highest stat powers. Why it’s Different: Unlike Hearthstone, Gwent has you amassing a sizable army of cards rather than a small group. By the end of each round, it’s not uncommon to have more than 20 of your cards on the table. Gwent is all about combining multiple attacks as you focus on utilising a good variety of melee, ranged, and defensive cards. There are even Weather cards you can use to throw an environmental curveball your opponent’s way. Overall: Creating a card game based off an established franchise sounds a lot like Hearthstone. However, Gwent has enough of its own unique gameplay that’ll make it worth your time. 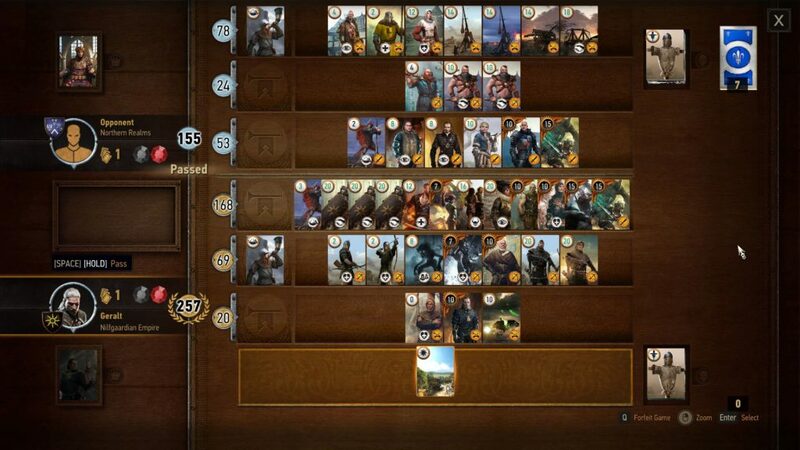 Read more about Gwent: The Witcher Card Game.